← Help Michael Henson Win An Award! I worked up some charts yesterday, both to gain insight into the Minnesota Orchestral Association’s math, and to prove (once again) that I am a massive nerd with absolutely no life whatsoever. 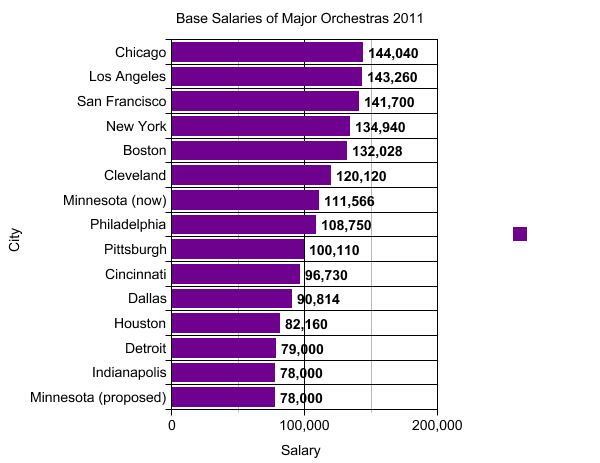 I used numbers gleaned from Wikipedia’s list of the population of American metro areas, this list the Strib published of orchestra base salaries, and a chart the Minnesota musicians made about other orchestras’ endowment sizes. First, I’m going on the assumption that the musicians’ numbers for other orchestras’ endowments are accurate. I don’t have access to any other information besides what appears on their chart, so I have no way of double-checking it or understanding its full context. If in future other sources appear that contradict their chart, I’ll gladly make note of that and update my own. So we here in Minnesota are sitting pretty pretty, especially once the BFF “artistic initiative and endowment support” money kicks in. Good for us. We’re clearly willing to pay top-dollar for great symphonic music. Since we’ve raised so much money per person compared to other cities, and since we’ll have the fourth largest orchestra endowment in the United States once BFF fundraising wraps up…surely we’re doing everything in our power to attract first-rate musicians? It wouldn’t be an efficient use of our money to do otherwise, would it? Question: Is there a reason that we’re near the top in the first picture, and at the bottom in the second? Here are the numbers… Chicago 1,4 (a difference of -3); Los Angeles 2,6 (a difference of -4); San Francisco 3,3 (a difference of 0); New York 4,5 (a difference of -1); Boston 5,1 (a difference of +4); Cleveland 6,12 (a difference of -6); Minnesota (pre-Henson proposal) 7,7 (a difference of 0); Philadelphia 8,8 (a difference of 0); Pittsburgh 9,11 (a difference of -2); Cincinnati 10,15 (a difference of -5); Dallas 11,10 (a difference of +1); Houston 12,14 (a difference of -2); Detroit 13,16 (a difference of -3); Indianapolis 14,9 (a difference of +5). Together all those average about -1. And what’s the Minnesota Henson proposal? 15,2 (a difference of +13). If the industry adapts the MOA’s equation of “the number of dollars in your endowment / 2500 = your base salary”, it would be justification for Chicago to lower its base to $96,000; Los Angeles to $72,000; San Francisco to $104,000; New York to $72,000; Cleveland to $52,000; Philadelphia to $52,000; Pittsburgh to $44,000; Cincinnati to $24,000; Dallas to $40,000; Houston to $24,000; Indianapolis to $36,000; and Detroit…(wait for it)…to $12,000. In other words, if the industry adapts the MOA’s endowment-to-base-salary ratio, there would only be a handful of full-time symphony orchestras in this country. And semi-pro groups? Forget about them. If this becomes the new normal, I’d probably have to pay my little regional semi-pro orchestra something like $2000 every time I performed with them. Orchestras. On second thought, do we really need them? I guess this is the question I’m getting at… Does literally every other orchestra in this country besides Boston have an unsustainable relationship between endowment and salary? Or is Minneapolis embarking on a plan rife with hugely alarming inefficiencies? What’s the MOA’s position on this? Would they say that endowment size is actually relatively irrelevant to salary? Then why is the endowment figuring so prominently in the discussion? Is the problem difficulty fundraising for general operations, or depressed earned income? 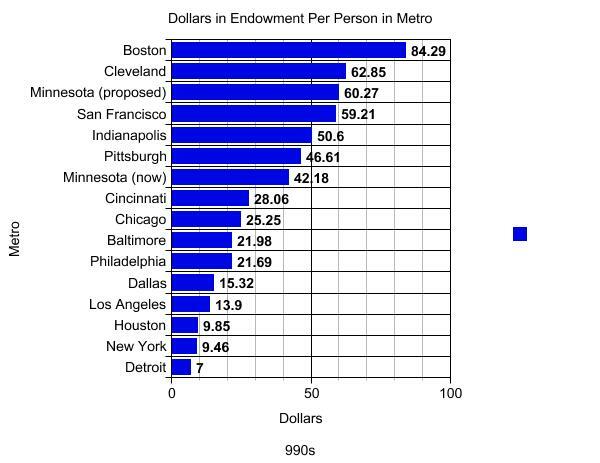 If the former, how (and why) did we accumulate the sixth largest endowment in the United States, and yet had so much difficulty garnering contributions that our salaries need to drop behind cities like Cleveland, Cincinnati, and Detroit? If the primary problem is depressed earned income…that’s a barrier that can be overcome relatively easily. I have no doubt that with the right people directing the effort, given our well-educated population, we could outpace what Cleveland’s doing. 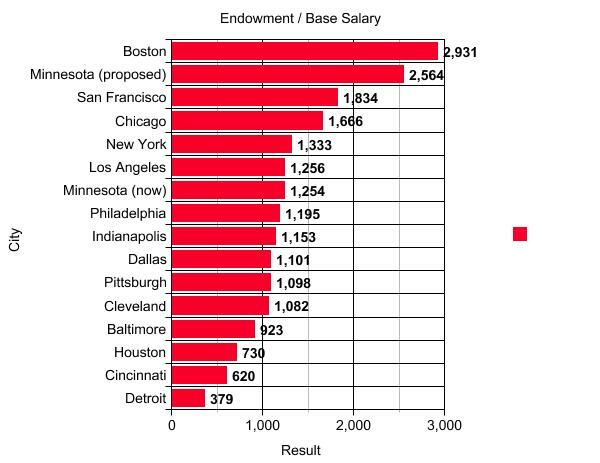 Why is the relationship between the endowment size and base salary at every other American orchestra (besides Boston) so dramatically different from the proposed Minnesota one? How big would the MOA endowment have to be to support the FY2012 Minnesota base salary of $111,000? According to the 2500x base ratio, we’d need to have roughly $278 million on hand. Where’d that ratio come from, since nobody else in the business besides Boston follows it, or even comes close to following it? Are all American orchestras besides Boston permanently unsustainable? It is all, as Mr. Henson likes to say, very puzzling. This is just one way of looking at things, of course. There are a lot of caveats. The methodology has its flaws. It’s just a thought experiment thrown out into the ether, and dissect it as you will. But I wanted to throw it out to you nonetheless, and see what you think. Feel free to shoot the numbers back at me in a way that will convince me I’m crazy. Thanks. Bravo, Emily! Thank you for illustrating the gobbledygook that the MOA upper management is peddling. Nothing about the financial situation here (and the way the current MOA management has handled things) makes sense when you look at numbers or how successfully the organization raised funds for the lobby renovation in the height of a recession. However, as we are all beginning to realize, when you look at the political and personal ideology of Jon “too big to fail” Campbell (VP at Wells Fargo) and Richard “blah, blah, blah… get over it” Davis (President of USBank)—with their willing posh little English puppet, Michael Henson— their alignment with ALEC and their agenda of union busting (among other things), it is entirely clear. I can’t wait for the agreed upon proposed financial analysis to be completed and see its findings… but I won’t hold my breath, because as we have seen, these three ‘gentlemen’ are out for blood and they really don’t seem to care how they accomplish this. Not the least bit dorky! This is some really important information that needs to be part of this discussion. Thanks for your extensive research and analysis! Well done, Emily! Holy crap, it’s plain as day when YOU talk about it. I hope the musician’s legal and negotiating teams can use it. “Artistic Initiatives” – you mean like Liquid Music?? As always, great job, Emily! And thanks for your continued effort to educate all of us out here in the blogosphere. So, maybe you’ve already written about this somewhere and I’ve missed out — who has the ability to, um, “relieve” these guys from their current positions? Emily, I am chair of the New York Philharmonic’s negotiating committee. We have a contract negotiation coming up very soon, and our management is talking about a major hall renovation beginning in 2017. Needless to say, we are all following the situation in Minnesota very carefully. I have been reading your posts for months, and admiring both your clear thinking and your analysis. These charts are priceless. We are deeply appreciative. I’ve read your piece three times now, and read it slowly and carefully to boot. It adds up. Given the information available, it is a very solid analysis and comparison with other American orchestras. I’m convinced. There is no excuse for this lock out, and there never was. If others have better information, or different methods of analysis, they should put them forth. If they can’t or won’t, they should then acknowledge the truth of your claims, and remain silent. Yeah, I’d like to reiterate that I welcome alternative viewpoints! I don’t analyze orchestras for a living. I’m not trained in how they work. I don’t claim to be an expert. And once again, I reiterate: I’m using the musicians’ numbers. One possible caveat I thought of in the middle of the night… Perhaps there is a difference in the sizes of the portions of various endowments that can be used to pay for musician compensation? I’ll gladly run the info on that, if I ever get it. As it is, however, I can’t; the MOA hasn’t made those numbers available to the public. We know supposedly how big the MOA Endowment is, but we don’t know the size of the Oakleaf Trust, or how much BFF money we have or will have, or what restrictions there are on that money. So the MOA will have to step up with more info before I can run more calculations. Wonderful information, Emily, and so well put! One other thing to keep in mind which has an impact on the Orchestra’s stability – annual audience and annual earned revenue. If the Orchestra’s revenue from concerts has been dropping over many years, it puts more pressure on the other two legs of the financial stool — annual fundraising and draw from the endowment. If paid audience has been shrinking over the last decade, it has a serious impact and also affects fundraising since a percentage of the people who buy tickets also make charitable contributions to the Orchestra. This would be an interesting analysis. The Orchestral Association’s annual reports over the last many years probably mention audience size. Someone posted a comment on one of the recent MN Orchestra stories, perhaps on a Strib or MNPOST story, that the Orchestra’s audience the last year it performed was 300,000 but paid attendance was something like 240,000. What was it ten years prior? Five years prior? Three years prior? During that same time, how does that compare to the number of concerts produced? Many of us remember the Minnesota Orchestra playing a longer regular season years ago, a shorter “holiday” season, and a wonderfully robust summer season. It may be the musicians are actually playing fewer concerts than they used to. Fewer concerts also mean less earned revenue – and less audience. On the flip side, the management would say that there’s “too much product,” (i.e. too many Minnesota Orchestra concerts to fill, and too much competition for the arts & culture entertainment dollar) and that the costs of marketing so much of the Orchestra’s concert inventory is too high — so it was necessary to cut performances to consolidate audience and/or paper the house. A full or close to full house often makes for a better concert experience for those that gather for the performance. Thanks again for your gift for asking thoughtful questions, and providing important analysis.